Standing out with its modern lines and special quilted workmanship, the Lounge Sofa Set offers one of the most spectacular examples of the season's modern luxury trend. It's truly an art piece. "Chesterfield" would bring a picture of a decorative look that often includes formal and masculine style codes into our minds. Doğtaş designers, who always chase the latest trends, introduce you Lounge Sofa Set, which is the new version of this iconic piece. Leather may be Chesterfield's usual material. 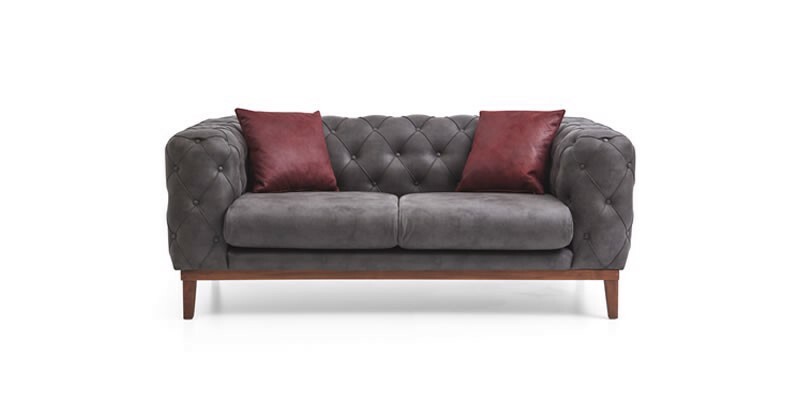 However, in Lounge Sofa Set where style borders are bent, leather-like fabric provides an attractive finish. Trendy colors are used instead of the classic brown we are familiar with for Chesterfields. The power of new inspirits a "cool" stance. One of the most innovative sofa sets of the season, Lounge consists of a three seater, a double sofa and a wingback. Quilted stitching on the back and arms is one of the attractive parts of the set. Long wooden legs can be according to your preference; in the color of ecru or walnut. Leather-like fabric that completes this modern look, is ready to adapt to your style with numerous color alternatives. An extra comfCOFFEEble seating experience is another answer to the question about why you should have a Lounge Sofa Set. In new world where dynamics change rapidly, style is the expression of your identity. Sometimes only our style allows us to have a strong aura. The Lounge Sofa Team, which adds new dimension to the classic style, calls for those who want to have such a solid temperament to Doğtaş.